Welcome back to our two-part series on why family time matters. We encourage you to go back and read part one in its entirety, if you get the opportunity, but the long and short of it is that our Grand Rapids aerial adventure park offers a great time for everyone in the family. Yes, even that broody teenager who loves to look at their phone more than another human’s eyes (we used that joke in part one as well). Yes, even the parent who isn’t too keen on physical activity or heights. Yes, even that four-year-old who has never done anything like this on the playground before! We offer treetop adventures at our outdoor aerial adventure park. Whether you are looking for a zip-line park in particular or are just trying to think of a family-friendly activity the whole group can enjoy, our obstacle and zip-line adventure is worth looking into! We fear that we’ve been teasing you for a while now, so we might as well get to it already! Below you’ll find some little-known and interesting benefits of family time. Shared Experiences Bring You Closer Together – It might sound somewhat basic at first glance, but it rings true nonetheless. 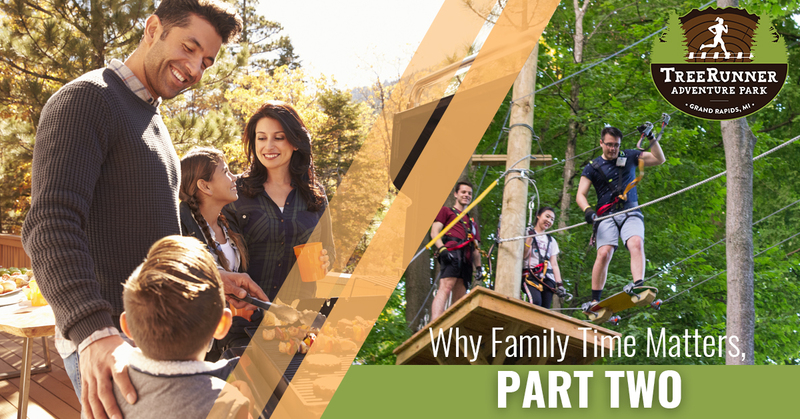 Whether you are at the ballpark with one another or you come visit our treetop adventure park in Grand Rapids, your family’s bond will be strengthened simply by spending time with each other. However, when you do something particularly exciting (like, maybe, challenging yourself while having a blast among the trees), you’ll be much more likely to cherish the memories you made for a lifetime. Those are the ones that last! Fewer Behavioral Issues – Simply spending time with your children will decrease the odds of them having behavioral issues. Why? There are a few factors in play, but perhaps none are more significant than children being able to learn interpersonal skills from an expert — you. That is, they’ll pick up on what is appropriate and acceptable, alongside what is not. They’ll learn how to treat others through your implicit modeling and verbal direction. That is neat! Additionally, spending time with the family results in less violence in teenagers. And that, too, is neat. Improved Academic Performance – Being around for your children has been shown to improve academic performance. This is never more important than in the early stages of a student’s, well studying. Encouraging them by showing you care will increase their chances of receiving a better education. As we all know, this will open myriad doors in their future! Greater Happiness – Maybe this is the only reason you need! In fact, most of us don’t exactly need any of these suggestions, but it’s a nice reminder if you feel like your family has lost its way of late. But whatever your family’s situation is, it’s wonderful to know that more family time can lead to greater happiness for your children. At the end of the day, we parents want what’s best for our children — and whatever makes them happy is fine with us! Additional Benefits – Truth be told, we might be here all day if we were to list off every single benefit that comes with spending quality time with the family. Spending time with your family results in a greater chance of success, improved conflict resolution abilities, communicative abilities, an improved emotional bond between parents and children, and many others! Clearly, family time something we should all be prioritizing. But just like anything else, the usual activities can become a bit stale over time. Just like you’d try to inject new life into a relationship that’s lost some momentum, there’s no better way to get everyone engaged and having fun than surprising them with something totally out of the blue! Yes, yes — we mean coming to visit us at TreeRunner Grand Rapids Adventure Park. If you are looking for a family adventure activity, we offer seven zip lines and over 60 aerial obstacles which range in difficulty from beginner to advanced. And if you are looking to get the extended family involved, perhaps for a reunion of sorts, keep in mind we can host events from 10 to 300 people! Schedule your appointment today, and bond with your family in a new way!